Hasn't the winter of 2017 been brutal? I think it was one of the coldest as compared to the winter of past few years in north India. Needless to say, the freezing winter totally kills your working vibe and all you wanna do is to curl up in a cosy blanket, read a good book or watch your favourite T.V series. But now that February is here, there's a huge relief. I had been falling sick on and off since December plus there were some other things that completely distracted me from blogging. Also, I was not able to take very good care of my skin either. The only thing that I managed to stick to was to apply the Innisfree green tea seed deep cream and not let my dry skin suffer throughout what seemed like an eternal winter. And, it will not be wrong to say that this cream alone tackled my dry skin. I did not need to follow a dedicated skincare routine or use too many products. This cream is thick, it's rich and it is very effective in delivering hydration to thirsty skin and in sealing moisture. So potent and nourishing this cream is that once you apply it in the morning you won't feel the need to reapply it throughout the day. Since it has quite a thick consistency, it isn't super gliding on the skin just like any other cream which tends to be more on the heavier side. It sinks in quickly and as a daily moisturiser it should be used in small amounts otherwise it'll feel too heavy and won't absorb instantly.The spotlight ingredient, green tea is sourced from the Jeju island in South Korea which is the least polluted area in the world and is also a place rich in natural resources which become the key ingredient in the formulation of many famous Korean beauty products. Skincare products infused with green tea usually smell good and this cream is no exception. I love its delightfully light and refreshing scent. This will also work as a really good nourishing night cream. 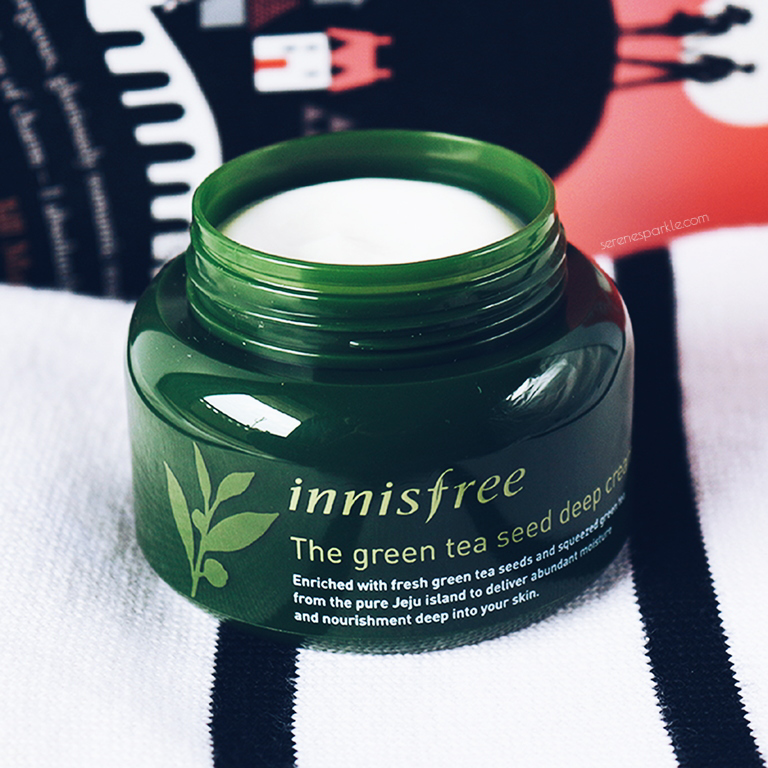 Innisfree green tea seed deep cream delivers ample comfort to the dehydrated skin. It repairs dry patches and helps bring back the skin to its normal state. It is the first time that I tried a cream from Innisfree and I'm not disappointed at all. However, it is way too pricey here in India so If you chance upon this in any of the duty-free stores then definitely give this a try. 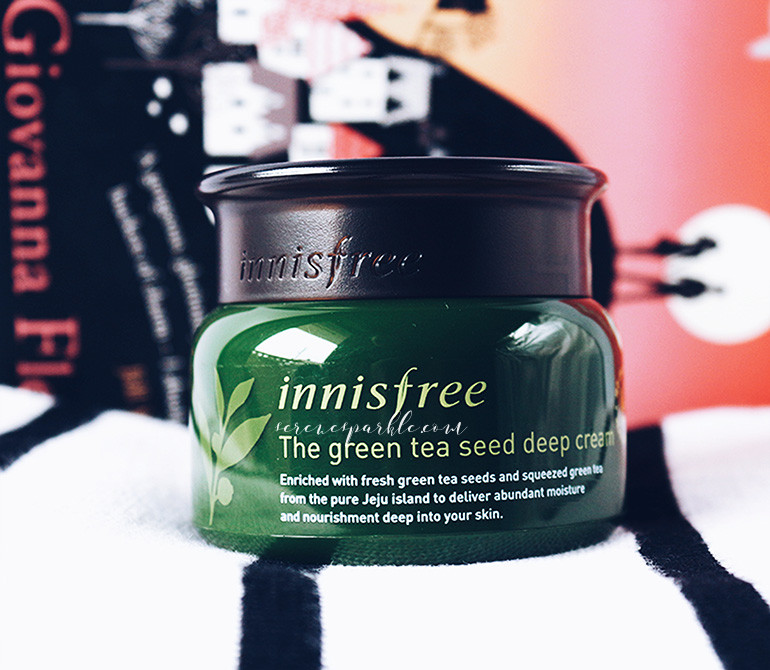 Have you tried Innisfree Green Tea Seed Deep Cream yet? Glad the cream worked for you. For me it is too pricey! it seems to work amazingly but i find it a bit too pricey... i wish it was a ;little bit lower in price tag :) loved the review..